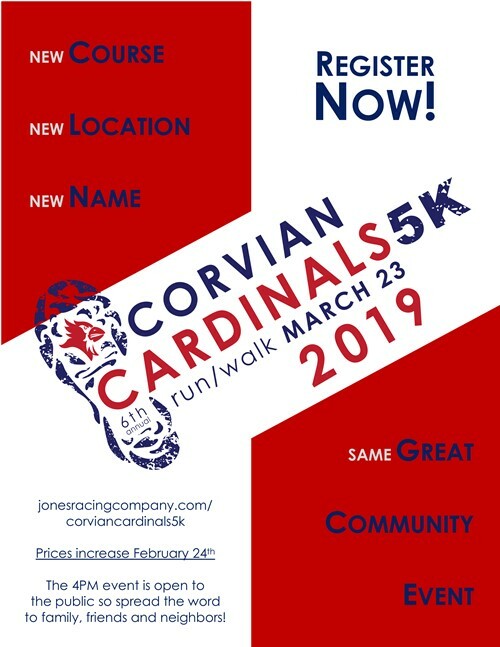 Registration for the Corvian Cardinals 5k is now open! Registration for the 6th Annual Corvian Cardinals 5K is OPEN! Come join your Corvian Family for a fun afternoon of racing on March 23, 2019. This year’s race will start and finish at the Corvian High School! Invite your family, friends and neighbors for an afternoon they won’t forget. Don't delay, prices increase February 24, 2019!